Slovo o polku Ihorevi (full title: Слово о полку Ігореві, Ігоря сина Святославля, внука Ольгова; Slovo o polku Ihorevi, Ihoria syna Sviatoslavlia, vnuka Ol’hova [The Tale of Ihor's Campaign, Ihor the Son of Sviatoslav, Grandson of Oleh]). An epic poem (see Epic poetry) of the late 12th century written by an anonymous author. History of the work. The original was discovered in 1795 by Graf A. Musin-Pushkin, ober-prokuror of the Holy Synod (1791–6), in the archives of Yoil, the archimandrite of the Transfiguration Monastery in Yaroslavl, Russia, and was published in Saint Petersburg in 1800 with the assistance of the paleographers A. Malinovsky and Mykola Bantysh-Kamensky. The original manuscript and many printed copies perished in the Moscow fire of 1812. The want of an original allowed a number of skeptical critics in the early 19th century (I. Belikov, I. Davydov, Mikhail Kachenovsky, O. Senkovsky, and others) to consider the work a falsification of a later date. Subsequent skeptics included the French Slavists Louis-Paul-Marie Léger and André Mazon (who believed that either Yoil or Bantysh-Kamensky wrote the work) and the Russian A. Zimin. Contemporary scholars postulating that the Slovo is a late 18-century falsification include E. Keenan and George Grabowicz. Keenan’s extensive study attributing the authorship of the Slovo to the Bohemian scholar and priest Josef Dobrovský was published by the Harvard Ukrainian Research Institute in 2003. The majority of scholars, however, believe it to be authentic. In 1818 K. Kalaidovich noticed an epigraph taken from the Slovo in the Pskov Apostolos of 1307. In 1829 R. Tymkovsky published a 15th-century manuscript, Zadonshchina (Past the Don [River]), that was modeled on the Slovo (plagiarized, according to Mikhail Speransky). A wide range of scholars, particularly Mykhailo Maksymovych, demonstrated connections between the Slovo and Ukrainian folk poetry. In the 19th century the poem served as the subject of studies by the Russians E. Barsov, Vsevolod Miller, N. Tikhonravov, Aleksandr Veselovsky, and P. Viazemsky. Ukrainian academics, apart from Maksymovych, who published works on the Slovo included Omelian Ohonovsky, Oleksander Potebnia, and Pavlo Zhytetsky. In the 20th century more than 700 major studies of the Slovo have been published in a variety of languages, including works by Dmytro Chyzhevsky, Mykola Hrunsky, Volodymyr Peretts, and Omeljan Pritsak. In the late 1930s, work on the subject was halted in the Ukrainian SSR and was limited to Russian-language studies commissioned by the Academy of Sciences of the USSR. Research devoted to the Slovo resumed in post-Soviet Ukraine with the publication of a collection of Russian-language studies of the epic in 1990 and a new translation of the work accompanied by his controversial interpretation of the Slovo not as a praise, but as a condemnation of Ihor Sviatoslavych and the descendants of Volodymyr the Great in general for the destructive results of their policies in Kyivan Rus’. A new, richly annotated translation of the epic by Pavlo Salevych was published in 1999. Another Ukrainian translation of Slovo was published in 2000 together with Borys Yatsenko’s extensive historical study of the epic. A study of the Slovo by Mykhailo Braichevsky that examined its specific features and its author’s ideological position within a broad sociocultural context of Kyivan Rus’ was published posthumously in 2005. Omeljan Pritsak’s extensive study of the historical context of the material presented in Slovo, based on which the scholar proposed the exact dating of the work (1202) and the identity of its author (a Galician boyar Volodyslav Kormylchych), was published posthumously in 2008. 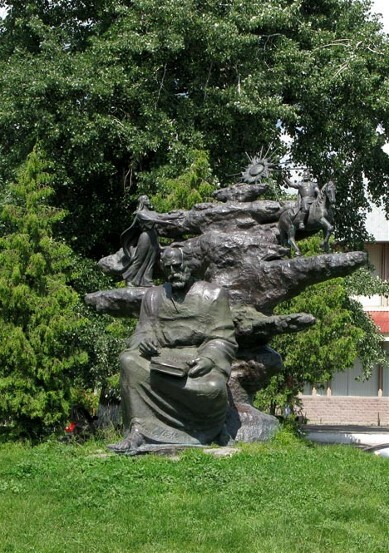 Owing to political circumstances Russian scholars were the leaders in the field; nonetheless, Ukrainians, Belarusians, and Russians all considered the Slovo as belonging to their own literature, since it is a literary monument of Kyivan Rus’, to which all three East Slavic nations lay claim. But no serious scholar has disputed that it was written in Ukraine, and that much of its semantic and poetic usage is characteristically Ukrainian. In the 1920s Mykola Skrypnyk sought to have the Slovo recognized as an exclusively Ukrainian work. Historical basis and content. 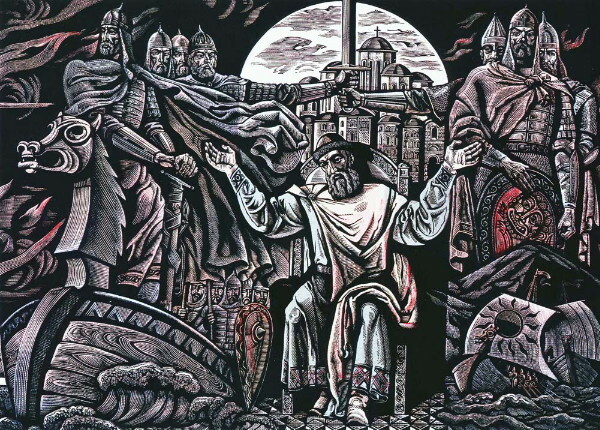 The subject of the poem is the unsuccessful campaign mounted in the spring of 1185 by Ihor Sviatoslavych, prince of Novhorod-Siverskyi, against the Cumans. Its central theme is the fate of the territories of Rus’. In addressing that theme the author condemns the various princes for their feuding and their selfishness at the expense of the general good. The poem was written in an epic lyrical style. The historical subject matter is interspersed with dreams, laments, nature's reaction to the hero's fate, monologues of princes, and other motifs and devices. The poem begins with an invocation of Boian, who sang the praises of princes of the 11th century. The author of the Slovo promises to emulate Boian's style and to join the glories of the past with those of the present. 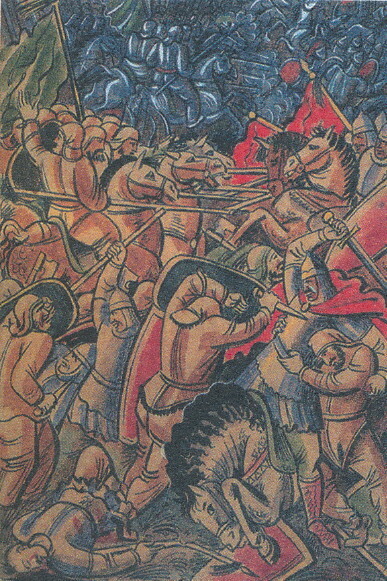 After a description of preparations for the campaign, of the three-day battle, and of Ihor Sviatoslavych's defeat the author proceeds to analyze the reasons for the decline of the Rus’ land. After a description of Ihor's escape from captivity the work concludes with praise of the ‘ancient princes’ Ihor and Vsevolod Sviatoslavych and of the ‘younger ones,’ represented by Volodymyr Ihorovych. Language and poetics. The language of the work is the contemporary Rus’ literary language, similar to that of the chronicles, but with a marked increase in the incidence of the vernacular. Most scholars believe that the author was from either Kyiv or Chernihiv, but others (A. Orlov, A. Yugov) contend that he was from Galicia. Some have surmised that the copy discovered by A. Musin-Pushkin had already been modified by succeeding generations of copyists and changed to adhere more closely to the Bulgarian orthography that was in use in the 16th century, or that even A. Musin-Pushkin's copy may not have been a copy of the original but a copy of other copies. Such multicopying could explain a number of obscure passages in the epic. The vocabulary is relatively limited; it consists of slightly more than 900 words, combining literary elements of the Church Slavonic with contemporary Rus’ terms and archaisms preserved in various old dialects. There are also some influences from other languages. The poem is particularly rich in epithets, similes, metaphors, the use of metonymy, and hyperbole. The author frequently personifies nature and represents it as a conscious being that either aids or harms humans. The rhythmic structure of the Slovo is a matter of considerable debate. All efforts to define its rhythmic structure, including those of R. Abicht in 1901 (syllabic verse), Fedor Korsh in 1909 (4/4 rhythm), Volodymyr Birchak in 1910 (Byzantine church canonic rhythm), E. Sievers in 1926 (theory of random stress), and Ivan Ohiienko in 1946 (rhythmic elements from ancient Hebraic verse), have been unsuccessful. Mykhailo Maksymovych sought to prove that the rhythm of the Slovo was a point of departure for the subsequent evolution of the duma. Pavlo Zhytetsky underscored the recitative character of the Slovo and claimed that each verse-sentence, regardless of the number of syllables, formed a poetic whole with a distinctive pattern of stresses. Filaret Kolessa demonstrated a connection between the poem and the laments that developed into dumas. The Slovo's poetic form lends itself to a wide scope of expression and can incorporate many different rhythms depending on the theme and mood. Translations. Translations and adaptations of the Slovo have appeared in many languages, but most are in Ukrainian and Russian. Ukrainian verse and prose adaptations have been done by Ivan Vahylevych (completed in 1836, published 1884), B. Didytsky (in the yazychiie, 1849), Mykhailo Maksymovych (1857), Stepan Rudansky (completed 1860, published 1896), Yurii Fedkovych (1866, 1902), Ivan Franko (1873, 1952), Omelian Ohonovsky (1876), Panas Myrny (1883, 1896), Omelian Partytsky (1884), Mykola Cherniavsky (1894), Ivan M. Steshenko (1899, 1967), K. Zinkivsky (1907, 1967), Vasyl Shchurat (1907, 1912), Mykhailo Hrushevsky (1923), Petro Kostruba (1928), Mykola Hrunsky (1931), Mykola Matiiv-Melnyk (1936), Sviatoslav Hordynsky (1936, 1950, 1989), Natalia Zabila (1938), Volodymyr Svidzinsky (1938), Maksym Rylsky (1939), Ivan Ohiienko (1949), Mykola M. Arkas (1951), Leonid Makhnovets (1953), Oleksa Kovalenko (1954), M. Kravchuk (1968), Ye. Pavlenko (1992), Pavlo Salevych (1999), and Borys Yatsenko (2000). 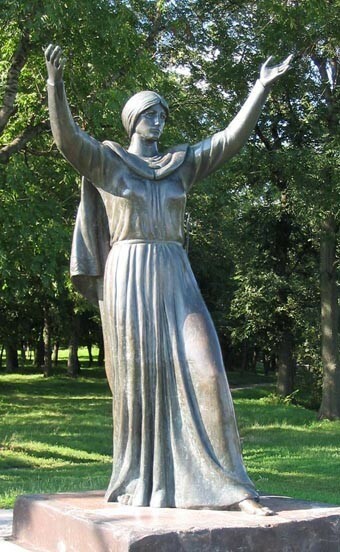 Ukrainian adaptations of fragments of the poem have also been published, including those of the ‘Lament of Yaroslavna,’ by Markiian Shashkevych (1833), Taras Shevchenko (1860), Vasyl Mova (1893), Bohdan Lepky (1915), and others. Yanka Kupala translated it into Belarusian (prose, 1919; verse, 1921). The first verse translation of the Slovo into Russian was I. Seriakov's (1803); it was followed by those of Vasyl Kapnist (1809), Vasilii Zhukovsky (1817–19), M. Delarue (1839), L. Mei (1850), Nikolai Gerbel (1854), A. Maikov (1869), E. Barsov (1887), K. Balmont (1929), S. Shervinsky (1934), G. Shtorm (1934), I. Novikov (1938), V. Stelletsky (1938), N. Zabolotsky (1946), A. Yugov (1950), S. Botvinnik (1957), and N. Rylenkov (1962). The first edition of Slovo evoked great interest in Germany's literary world. In 1803 J. Richter published one of the first translations of the poem, followed by J. Müller (1811), A. Boltz (1854), Friedrich Bodenstedt (1861), R. Abicht, Rainer Maria Rilke (1904, printed 1930), A. Luther (1923), E. Sievers (1926), K.H. Meyer (1933), H. Raab (1963), H. Baumann (1968), Sviatoslav Hordynsky and L. Kaczurowskyj-Kriukow (1985). The poem was translated into English by L. Wiener (1902), L.A. Magnus (1905), H. de Vere Beauclerk (1918), B.G. Guerney (1943), S.H. Cross (1948), V. Nabokov (1961), Constantine Andrusyshen and Watson Kirkconnell (1963), I. Petrova (1981), D. Ward (1985), and others. French translations have been published by N. Blanchard and N. Ekstein (1823), F. de Bargon (1878), N. Koulmann and M.-L. Behaghel (1937), and H. Grégoire (1945). Polish translations of the Slovo include those of C. Godebski (1821), S. Krasiński (1856), Bohdan Lepky (1899), and Julian Tuwim (1927, 1944). Czech translations include those of V. Hanka (1921) and F. Kubka (1946). 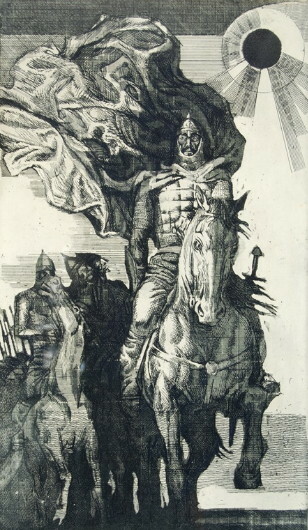 Other languages into which the epic has been translated are Serbian (I. Khadzhević, 1842; I. Šanković; and others), Slovene (M. Pletershnik, 1865), Bulgarian (R. Zhinzifov, 1863; L. Stoianov, 1954), Italian (D. Ciampoli, 1911; E. Lo Gatto, 1928), Spanish (J. and R. Maikiel, 1949), Danish (T. Lange, 1888), Hungarian (S. Ridl, 1858; Hiiador Strypsky), Hebrew and Yiddish (S. Mendelssohn, 1875; D. Hofstein and I. Fefer, 1938), Abkhaz, Bashkir, Armenian, Georgian, Kazakh, Tatar, Uzbek, Rumelian-Greek, and many other languages. Hnat Khotkevych wrote a historical play based on the Slovo in 1926. Hryhorii Luzhnytsky also adapted it for the stage. 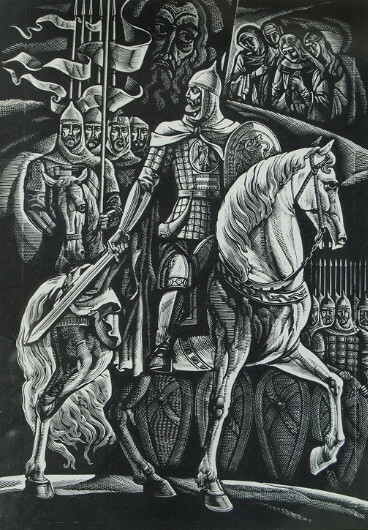 A. Borodin used motifs from the poem in his opera Prince Igor, as did Mykola Lysenko in his Plach Yaroslavny (Yaroslavna's Grief). Painters and graphic artists, such as Heorhii Narbut, Petro Kholodny, Olena Kulchytska, Petro Andrusiv, Jacques Hnizdovsky, V. Lopata, Heorhii Yakutovych, as well the Russians V. Vasnetsov and V. Favorsky, drew inspiration from the epic. It is also reflected in the sculpture of Mykola Mukhyn and Antin Pavlos and in the stained-glass compositions of Leonid Molodozhanyn. A referral to this page is found in 57 entries.